A bit late, but here’s a drawing in wallpaper format in celebration of the Ubuntu 10.04 release and the new visual identity that made its first real appearance with it. Mark Shuttleworth is the founder of Ubuntu/Canonical. Additional software packages for Ubuntu are organized in Universe and Multiverse. The packagers are called Masters of the Universe (MOTU), referencing an 80ies toy line / animated series, with a hero known as He-Man. So this led to the idea of He-Mark. The UDS-M video interview might be the best reference, if you can’t compare with the real Mark. 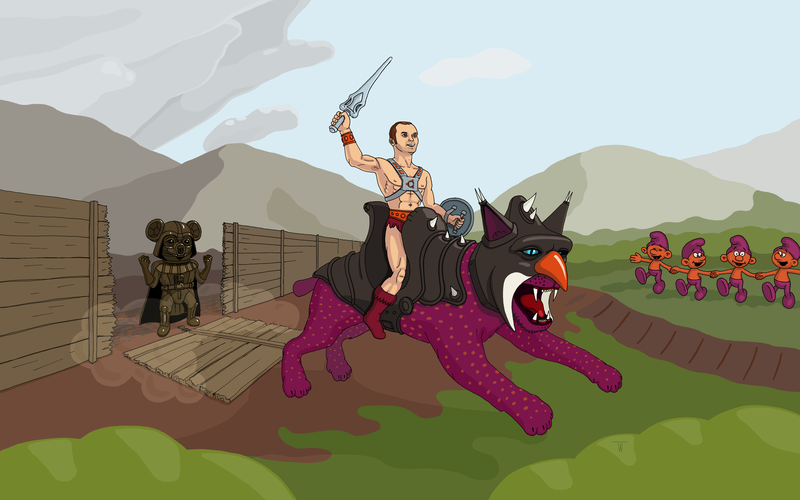 He-Man rides on Battlecat, a beast resembling a tiger. The mascot for 10.04 is a Lynx, so my version of Battlecat had to have characteristic ears, a short tail and dots. Battlecat’s helmet has a beak … as have penguins, so I had a color scheme for the armor. Aubergine is the new color for Canonical and the business-oriented aspects of Ubuntu. The 9.10 release still had the brown (and orange) look and a Koala as mascot. The arch-enemy of He-Man is Skeletor. Ever had a look at the skeleton of a Koala? Well, I borrowed elsewhere. Darth Koala was born. The small fellows represent the community, of course. Made with MyPaint and GIMP. Note to self: watch out for anti-aliasing issues with too thin lines right from start. Wow, that looks even more gay than the original He-Man. I thought that would be impossible. If you put it on deviantArt, let me know and I’ll add it to the ubuntu artists featured gallery.